25 years ago, the South Asian nuclear tinderbox was primed for a spark. 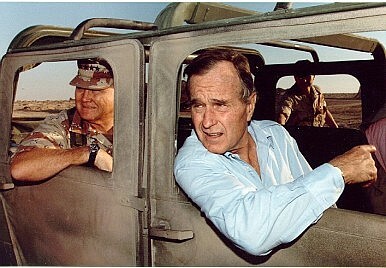 In May 1990, then-U.S. President George H.W. Bush was convinced that Pakistan was poised to use a covert nuclear weapon capability against India. The impending apocalypse—which would have dwarfed Hiroshima and Nagasaki—had to be prevented at all costs. Consequently, the White House dispatched a trusted emissary, Robert Gates (a man who would later become U.S. Defense Secretary in the George W. Bush and Obama administrations) on a top secret mission to South Asia—first to Pakistan and then to India. Eventually on May 21, 1990, it was concluded that the Gates mission had indeed succeeded and, paradoxically, the sense that the U.S. emissary obtained, when he met senior Indian officials and the Indian Prime Minister VP Singh, was that Delhi had not perceived any such threat. If Pakistan’s army, which controlled the ‘button,’ had incontrovertibly contemplated using the nuclear weapon, then this information/intelligence had only been picked up by the White House. Early 1990 marked the beginning of an escalation in Pakistan’s covert support to terrorism in the state of Jammu and Kashmir, and the Indian establishment was facing a complex internal security challenge which was clearly being stoked by an external agency. If indeed the Pakistani army was using its nascent nuclear weapon capability to create a firewall to ‘deter’ India even while abetting terrorism, then this would mark the beginning of a state actor engaging in nuclear weapon-enabled terror (NWET). Was May 1990 another Cuban missile crisis with terrorism overtones that had been averted in the nick of time? The intervening decades have not shed any significant new light on this opaque chapter of global nuclear history, though the exigency of a deviant state or a non-state entity acquiring weapons of mass destruction (WMD) and supporting terrorism has been listed as the most serious challenge to U.S. and global security. The U.S.-led war against Iraq in 2003 is illustrative of this linkage. However, 25 years later we know very little more than what was made public a few years after the purported South Asian nuclear crisis. There are many distinctive aspects about May 1990 and, as it happens, it was noted investigate journalist Seymour Hersh who wrote the first exhaustive account of the crisis almost three years after the event. The Hersh account is very detailed, and, as in the case of his most recent revelations about the Osama bin Laden killing, the 1993 account of what had happened in South Asia at the time raises many questions that still remain unanswered and shrouded in what may be perceived as determined obfuscation and a progressive erasure from the collective strategic narrative. The most searing U.S.-related security development over the last quarter century remains the enormity of 9/11 and the anxiety about the tangled linkage between state-sponsored terrorism and the quest by a deviant regime or institution to acquire WMD. The 2003 Iraq war was prosecuted along this misplaced conviction even as other nuclear-related realities with respect to Pakistan were being glossed over. From the Indian perspective, this U.S. obfuscation of the Pakistani stratagem of NWET culminated in the November 2008 terror attack on Mumbai. The fact that both the U.S. and China have chosen to turn a blind eye to the Pakistan army’s brazen use of the nuclear shield while covertly supporting terror as a tactic has further emboldened the deep-state in Rawalpindi. Did the U.S. make its Faustian bargain in May 1990 and has it consequently paid in both treasure and American lives even as Pakistan honed its ‘run with the hare and hunt with the hound’ strategy to confound the White House? These are difficult questions and need to be addressed objectively. A useful starting point would be a rigorous review of the purported South Asian nuclear crisis of May 1990 when some of the principal interlocutors in all three countries—the U.S., Pakistan and India—are still able to reconstruct that muddied narrative. This in turn could yield some valuable regional policy correctives. The alternative of glossing over this almost forgotten incident, which in professional quarters has oscillated across the full spectrum from fanciful charade to full-blown crisis could prove very costly if a real crisis were to erupt in the uneasy southern Asian region. Even 25 years later, the May 1990 crisis symbolizes the barely discernible tip of a very murky nuclear iceberg and needs to be acknowledged in a more holistic and definitive manner. The author, a retired Commodore, is one of India’s leading experts and critics on security and strategic affairs, and director of the Society for Policy Studies in New Delhi. U.S. President Barack Obama hints at the nuclear uncertainties between India and Pakistan, upsetting India.